Two decades of scraping out the insides of a skull while molding and constructing it onto a canvas is a peculiar condition for any one’s obsession with the grittiness of dirt; the jarring impression of thick, coagulated, blood cells, dried, evaporated onto an intentionally placed marker; a fascination with the womb, the memory of the inhaled scent and taste and stain of Jezebel juices and ejaculates, haunting the lust for intimacy lost, aching the whole-heart place. “Process” is not a fair enough term to describe this way of working out a condition of tenacious sensing and interpreting, while incessantly needing to convey how the swelling and often catastrophic functions of breathing while seeing the subtext that all things organically material are induced into an inert state. It is consciously interpreted by the limitations of the fleshy, cerebral mechanism. Homeostasis is not the essence of this work. From maker-mind to visually abstracted, philosophical manuscript, it is distillation, excretion, sublimation, excavation, awkward undulation, and the consumption of the proverbial placenta into the continued being of an ever-ailing cognizant being. Balance is the aspiration, but sometimes the scales are tipped so far heavy that the only way to lightness is to relieve them of their weight. This work is only that, work, in constant fluctuation with all that entails experience through hoping, finding, and losing, all the while with an active consciousness that it is meaningless in geological time and space. A footnote of passions dislocated as personally as it is represented. This presence of mind and acceptance is at the core of Kelly’s intentional purging of all the fixed-life transferred and is now being offered to the selective placements of other souls who find it resonant. “All things too shall pass,” and reverence is brutal in its way of letting be and allowing to be laid down. Mr. Larsen has had an interest in the creative, affixed to earthen meaning, as long as he can remember. He began finding his own style through photography and the fixed image on screen and print. Attaining his Bachelors of Fine Arts undergrad at Utah Valley University, he then moved on to the Pratt Institute in Brooklyn, New York, where he completed a masters level degree, and subsequently provided some of his works to galleries in Manhattan, such as W83. Drawing further influence by, Gustav Klimt’s figure work and patterns, Frances Bacon’s Grotesque Honesty, Anselm Kiefer’s use of materials, as well as alchemical properties, he honed his vision coupled with his latent inspirations. Musician friends and recording artists have always been an integral part of his creative process, while actively working in the studio. Conceptualizing structural art and portable land-art, as a rejection of traditional art, he gravitated toward material sources not purchasable through conventional art supply stores. This was core to the development of how he would work the visual medium. 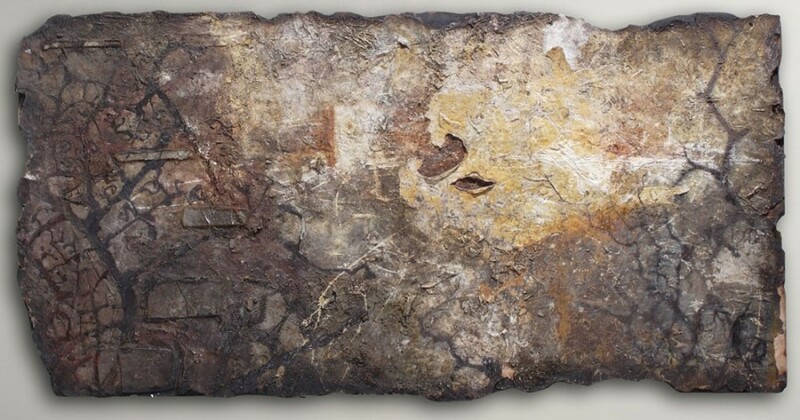 He endeavored to find organic substitutes for coloring-light-fastness, or the time it takes for the pigment to stay fixed in its original hue, through discovering plant materials that would remain in a natural state, more or less constant once on canvas, such as beet, wheat grass, coffee, wine, turmeric, cayenne, powdered charcoal, and so on. He incorporated oxidized steel, plastics, broken glass, the dirt particles collected from the land spot having become hallowed. He scavenged for earthen and biological remnants materials on the ground, finding metal and discarded particles while surveying the land, and repurposing disposed waste or antiquated refuse and applying them to “fixture,” becoming the preferred modality, then utilizing various sculpting and chemical techniques to shape the forms. Life events, of course, inspired a focus on burial and death, after lived experience within the environment. This was a major impetus. When in the process, figuratively, “in the zone,” as he puts it, he allows himself to suffer. It’s dark, rich. Blood boils. It’s hot, dirty, uncensored. Nothing can be excluded, the good nor the bad. The focus, again, is on the earth’s surface, the epidermis, which is seen through interpretation as history, as opposed to the itinerant, ethereal sky. Experimentations with hallucinogens, for him, didn’t cause an ascending float into the mesosphere, but a found placement into the ground. He deliberately put himself there, into the ground. In a refusal to deny intrinsic human truths, he electively lived within and as part of garbage. Acknowledging that we, as a species, tend to hide things, he sought to expose the history of life and death, comprehensive of the now oft disregarded fact that the sprouted seed of life grows from mother earth. The idea of the botanist putting seed into ground as a giver of life and an exposer of death was always a source of intrigue. There is a struggle to find balance throughout visual, beyond linguistic work, as is universal with any prolific and aspiring artist, where there is a laborious and final decision which is made in conjunction with what materials are at hand, and then placed onto canvas. It is this inner struggle which finally allows for the balance pursued. Kelly perceives his role as creator interceding the space between the conceptual abstraction being born as object and then allowed to die in finality. Life is given, death is given, and to include both of these allows a presentation of both sides of the truth. It compresses his response-ability like a dense weight to possess, trying to include pain and suffering along with happiness and joy. The figures are rich, undeniable. Relationships are life’s revery monuments. Here exists the diseased side of creation in need for a lover, almost a co-dependency, perhaps a schism between the two individuals, that is a craving attained through its temporary experience and the suffering in longing and absence. The figures, themselves, aren’t depictions of the conjoined relationship, but about the person as subject, typically a unitary figure who was the embraced lover. Loss is central, about the cherished found, and a cessation of the relationship in the development of the image. Eventually, it lives, dies, fluctuating between syncopation, and dissidence. Tapping into the spiritual and metaphysical of what’s envisioned, obsessed over, and come out of. That obsession is metamorphosed through a transcendence as opposed to transformation. The object is just something that’s needed to interact with, in order to transcend the present. We can never anticipate who we will become two decades into the future. The mental state produced by this battling of personal proclivities and desires is endured emotively, by the act of creation, where convoluted levels from the basement to the rooftop, the cavern to the summit, are witnessed through the active engagement with contention and concern, suffused with our mass social and ecological status of consumption and waste. Then came a weaning off mental fixation. An emerging from the cave first discovered then explored. This event is catalytic to a further relinquishing of the past, and a burgeoning of a new, personal, even socially historical epoch. Purgatory is emblematic of our limited comprehension of inescapable pain, which must, by all nature, eventually pass. As individualistic as the works may be, experimentally, the universal quality of cognizantly sentient life is represented, demise and suffering as acceptance, contentment as rebirth, a knowing that all things but our inescapable entanglement with the ground, itself is only temporary. There remain no lingering modes of convention. Though it was never a supposed goal or even the purpose of this work, creation has resulted in objects of grief, wanting, acceptance, and change, which is ultimately one of transcendence, as the result of artistic growth and humanistic entropy. For Kelly, as with any other pure artistic personalities, it’s always been about catharsis as an offering for the senses to re-incorporate into understanding. Healing through giving off, up, away.